The Contorted Hazelnut Henry Lauder's Walking Stick is a fun conversation piece to any landscape or garden. 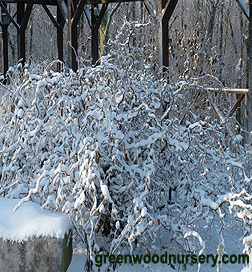 Corylus avellana ‘Contorted Filbert’ provides year round interest, especially in winter. Also known as Harry Lauder’s Walking Stick, the branches of this small, low growing tree twist into strange and odd shapes. Spring, summer and fall find this small flowering tree covered with large leaves which moving into late fall/early winter fall to the ground exposing the unusual gnarled branching structure. The leaves of this dwarf hazelnut tree drop just in time to reveal its blooms, green catkins which gradually brighten to a golden yellow as the mature in late winter. As the catkins grow, a purple female blossom will appear at the top of the green blossom. Mostly this purple blossom is missed because of its minute size. While it often produces a filbert nut, it is not edible. The nuts of this Contorted Hazelnut are most attractive when left on the tree. Allow a 10’ x 10’ area for the Contorted Filbert to expand. This plant has been propagated from cuttings to grow on its own root system. Contorted Hazelnut Henry Lauder's Walking Stick is a grafted plant grown in a one gallon container. Cannot ship to OR, WA, CA, AZ. When will Lauder's Walking Stick (non-grafted) be available?